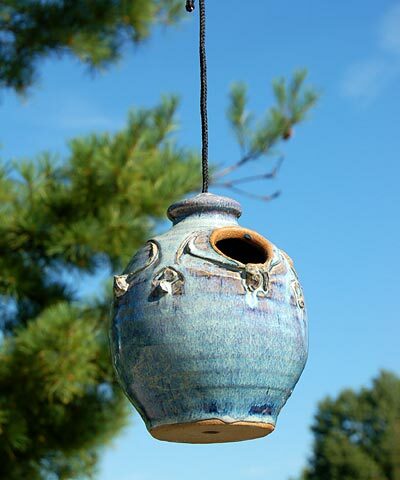 Offer birds an artistic roost in your garden with the Anthony Stoneware Bird House. This home offers shelter for small songbirds. The fluted sides create a dramatic shape, while the slightly textured exterior adds movement. Ovals around the top of the unit bring more interest, and small decorations under each oval complete the look. The 1.25" diameter entrance hole is perfect for small birds, and the attached black fabric cord allows this home to be hung virtually anywhere. The light blue glaze contrasts with your natural surroundings. The home has a small hole at the base, to drain excess water and keep the nest dry. This house is hand thrown on a potter's wheel and then fired to 2400° Fahrenheit, for a durable vitreous product. The unit will not fade, decay, or break down after exposure to UV light, for use for several seasons. Create a focal point in your bird sanctuary with this Bird House. Made in the USA.